As of early 2018, all recorded through-paddlers had opted to progress from west to east, starting in Old Forge NY and finishing at Fort Kent ME. There's a reason, a very good reason, that this is the default direction of through-paddle: the ratio of downstream to upstream miles. In seeking a challenge greater than the already considerable challenge of a through-paddle, I decided to attempt to buck the trend, to defy the odds, and to become the first recorded through-paddler to go the other way. To cut a long story short, I departed Fort Kent on 14 May, and 28 days later on 10 June paddled into Old Forge, exactly on schedule, completing four weeks of some long days of intensely hard paddling and some sublime moments. My entire journey was self-powered, involving paddling, poling, wading (it would be an overstatement to refer to tracking and lining), and carrying. In contrast to last time, I was blessed with some gorgeous weather, often bright sunshine and blue sky. There were only 5 days when it rained while I was paddling, and another couple of evenings and nights when there was a little rain, but never a washout. My biggest gripe was the wind, which defied all laws of probability, even allowing for prevailing wind directions, and blew hard in my face for too much of the time. As if upstream travel were not hard enough, being slowed down by the wind added significantly to the effort required to make progress, and, indeed, on one occasion it brought me to a complete halt, unable to paddle into it; that's never happened before. This is a feat that I feel no need to repeat. It is not the best way to see some magnificent rivers: creeping along the edge trying to find every last bit of slack water. There again, it gave me a new perspective on some of the other rivers, now experienced downstream. I've said before that the harder one has to work to achieve something, the greater is the sense of fulfillment on achieving it. That remains true, oh so true! This site is much like the account of my 2013 trip; the pages were largely cloned and then the content altered. The Plan/Reality page gives a comparison of my expectations during planning with how the reality turned out – this time there were fewer discrepancies between the two, indicating that I did in fact learn from the experiences of last time. The Stats etc. page includes all of the numbers that might interest a reader (if you'd like to see more, please let me know what's missing), as well as some “Before” & “After” photos of canoe and paddler, details of how you may become eligible for a reward, and an utterly trivial bit of musing (which helped to keep me sane; well, that's questionable!) The “Journal” link takes you to the day-by-day account, reproduced from what I recorded at the end of each day. Any later qualifications or indications of foresight, which clearly could not have been my thoughts at the time, are identified as such. The journal starts at Day 0, the day of travel to Fort Kent, the starting point, mainly as an excuse to include my waking experience that day. The NFCT is a series of traditional waterways which span the northern forests of the north-eastern USA. Long before highways existed, these waterways were the main thoroughfares, and the canoe has long been the primary craft of choice upon them. The trail stretches some 740 miles, crossing several different watershed divides as it wends its way between Old Forge in the south-western Adirondacks of New York State and Fort Kent on the St John River in Maine, taking in the Adirondacks, Lake Champlain, northern Vermont, a loop in the province of Québec, northern New Hampshire, and a large part of northern Maine. It includes upstream and down, small and large rivers, placid and white-water, small ponds and large lakes. More information about the trail can be found at the NFCT's website. Whilst I enjoy travel by canoe, and can still enjoy beautiful surroundings while maintaining high mileage, this journey was very much about the challenge. Would I be able to travel upstream against rapids? Would I be able to sustain the will-power to keep going when being constantly beaten back by current? Of course, it was not upstream all the way, but, compared with a conventional through-paddle, there was much more upstream. The other aspect of this trip was to carve a little place for myself in history, to be the first recorded through-paddler going the “wrong way”. Only one person can be the first to achieve something. I was too late to be the first to through-paddle west to east, too late to be the first to repeat a through-paddle, but was not yet too late to plant my flag on this little patch of ego-turf! I started paddling on 14th May, with the aim of finishing in 4 weeks, a schedule which I kept to. Once again, paddling in the spring gave me the greatest chance of enough water. That may sound perverse, since more water flowing against me would make it tougher, but I hoped to remain in the river beds as much as possible, rather than carrying, and having enough depth of water would make paddling much more feasible. I have often maintained that I much prefer to paddle a canoe than to take it for a walk! As it happens, even though the St John and Allagash Rivers had been in spate just a couple of weeks before I started, spring was essentially very dry with minimal precipitation, so river levels were much lower than my previous experience. 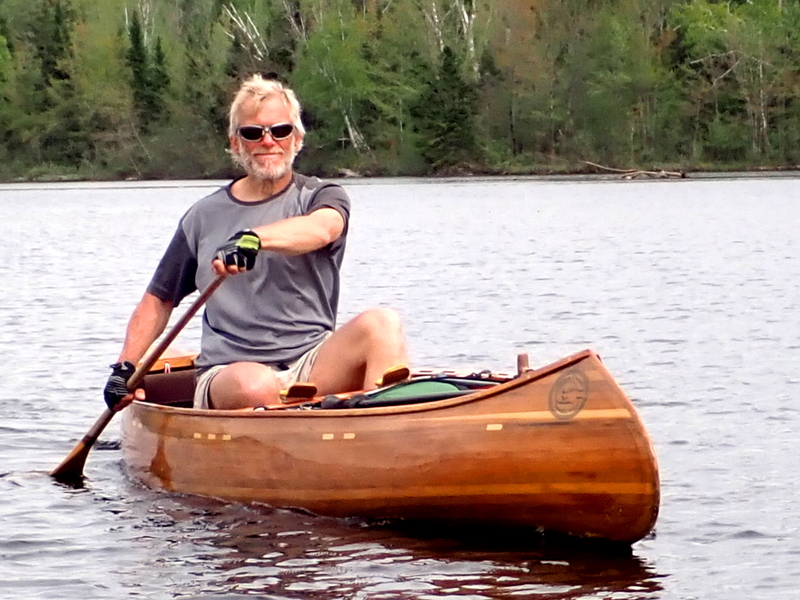 For more information on the boat, as well as the rest of my canoe-building business, please visit Otter Creek Smallcraft. I carried a SPOT Satellite GPS Messenger, and used it to send messages to my support team, complete with latitude and longitude at the time of sending. Almost all the messages were the standard “OK”. For the first time ever, though, I used one of the other messages indicating that I was delayed by a problem. This is described on day 5 of the journal.